They say a picture is worth a thousand words. Well, in this case it’s worth about 20 something and some numbers too. Any Zootopia fans out there? Abi makes the best “Flash” faces, those long drawn out smiles like the sloth! It’s the best! It’s safe to say these have been the longest 2 months of my life, but that has little to do with Abi, just coincidental timing I suppose. It sure is odd feeling like she’s been here for longer though. Usually these months fly by way too fast, but I feel like she has to be at least a year old by now with everything that has happened in these last two months. We love you, Abi Cadabi! I’m praying big things for your ‘little’ self. You certainly have been a gift from the Lord through a very difficult season in my life. I’m so thankful for the bond I already have with you because of this. 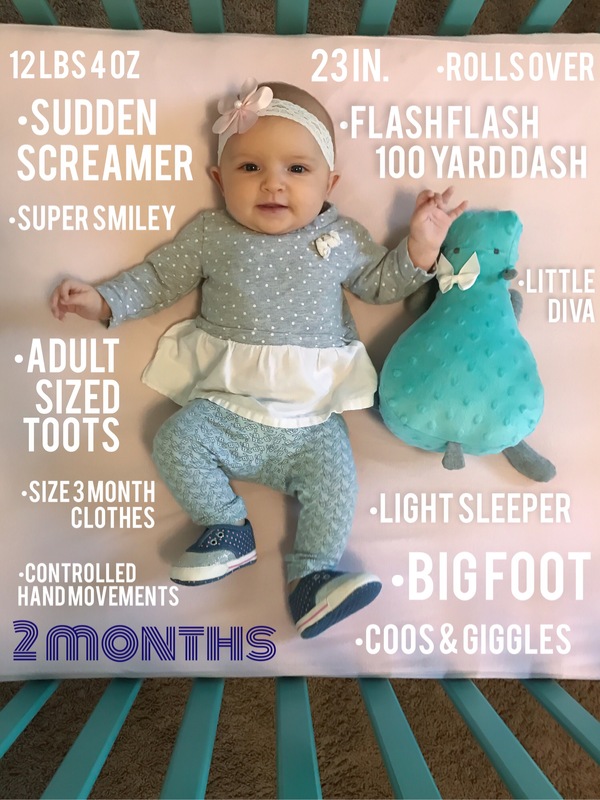 Happy 2 months, baby girl! I meant to say “She” is beautiful!